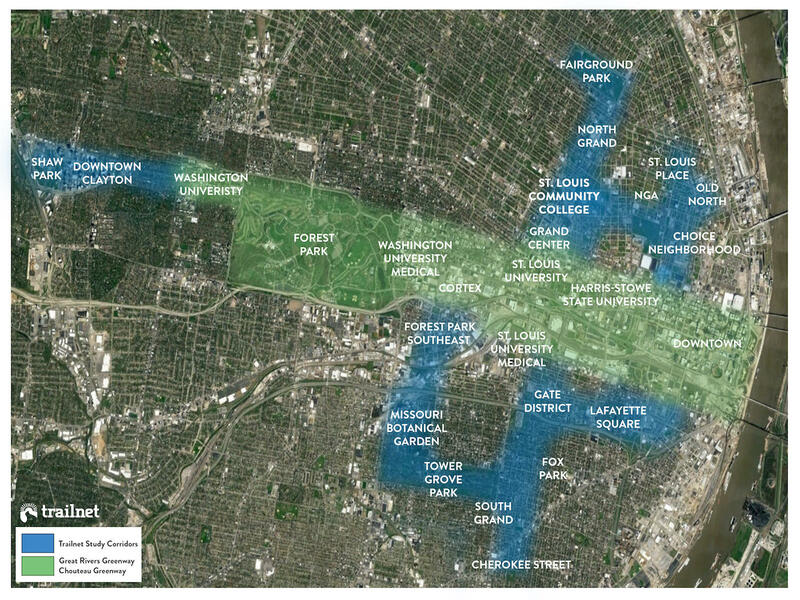 Trailnet wants to build a network of bicycle and walking trails that would connect St. Louis' north side and south side neighborhoods to an east-west trail that stretches from downtown to Washington University. The nonprofit, which has been working for several years to develop a network of protected trails on existing city streets, has released a map that shows the general location of the proposed paths. They reach north to Fairground Park and Old North and south to Lafayette Square, Tower Grove and Cherokee Street. Trailnet CEO Ralph Pfremmer said the trails would connect to a “spine” — the Chouteau Greenway — an east-west path being developed by Great Rivers Greenway that stretches from the Gateway Arch to Forest Park and Washington University. An international design competition is under way for the Chouteau Greenway. Determining the specific routes will require input from the public, Pfremmer said. “And that has a lot to do with public engagement and looking through our lens of racial equity — looking to make sure that this project is equitable for everyone in St. Louis,’’ he said. “We’ll miss the mark if we don’t do that. 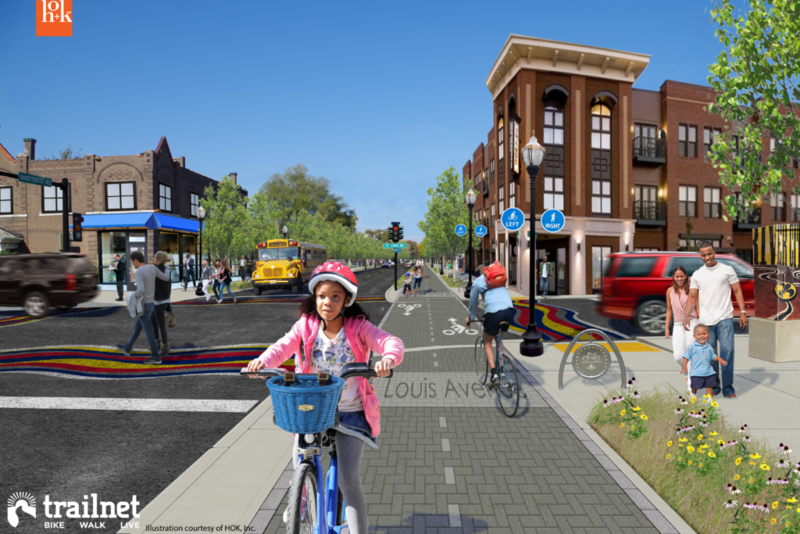 Proposed paths would be built on existing city streets. The project would also work with the Forest Park Great Streets project and bikeways planned by the National Geospatial-Intelligence Agency, Pfremmer said. 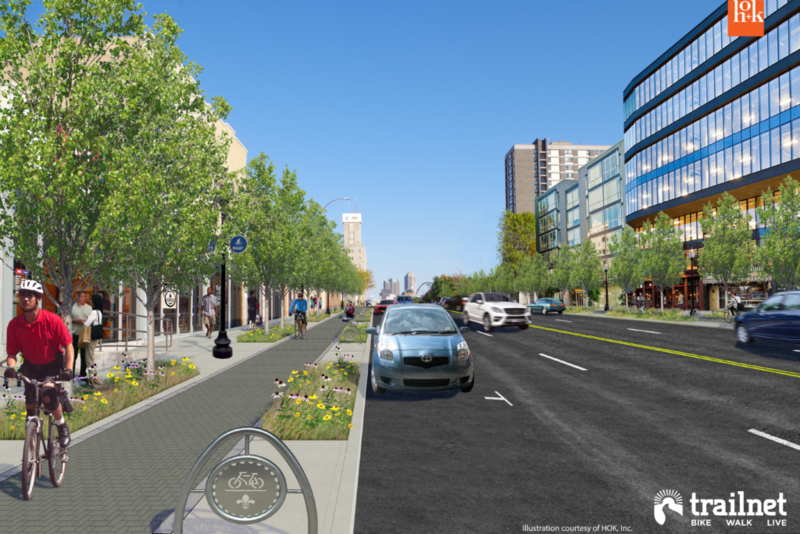 Trailnet has looked at the eight-mile Indianapolis Cultural Trail as a model. That program has reaped economic benefits for Indianapolis, Pfremmer said. He noted that other Midwestern cities are also making strides with their urban trails, and it is important for St. Louis to keep up. The Indianapolis Cultural Trail cost about $63 million, but Pfremmer said it is too early to estimate the cost of the St. Louis project. Trailnet is still studying funding options, but he believes it would be through a public-private partnership. Map shows the general paths of the protected bicycle and walking trails. The specific streets have not been determined yet. An eight-mile urban trail in Indianapolis is serving as a model for a similar proposal in St. Louis. Trailnet has announced plans to put together a 12-mile network of walking and cycling trails to connect the city’s cultural and entertainment districts. Organization officials say it could be key in convincing more millennials to put down roots here. If numbers tell the story, bicycle ridership in St. Louis has boomed. A 2014 study from the League of American Bicyclists shows the number of bicycle commuters increased 269.9 percent between 2000 and 2014. That staggering number isn’t the only sign that St. Louis is making a push to be a bicycle-friendly city. 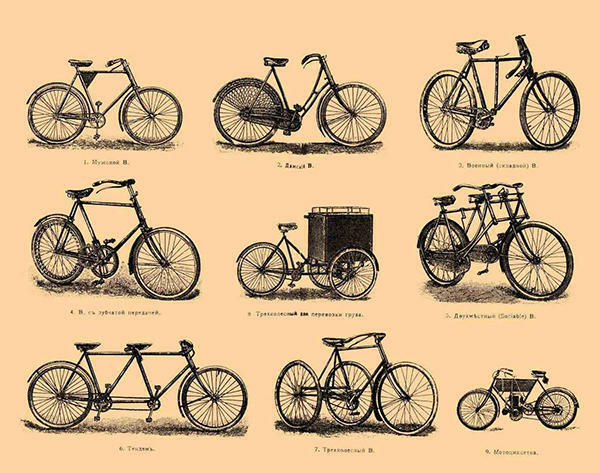 As the area celebrates national Bike to Work Day on Friday, it's time to take a look at improvements that have been made and needs still to be addressed. Liane Constantine and her 6-year-old son, Ashton, live about half a mile from where he takes taekwondo classes in a small strip mall in Kirkwood. It would be easy enough to walk there, if only they could safely cross Manchester Road. “ … I’d have to grab him by the hand and say ‘run when we don’t see any cars’,” she said, standing on the unpaved street corner that doesn’t have a crosswalk. Instead, they’re forced to drive, unnecessary as it seems. 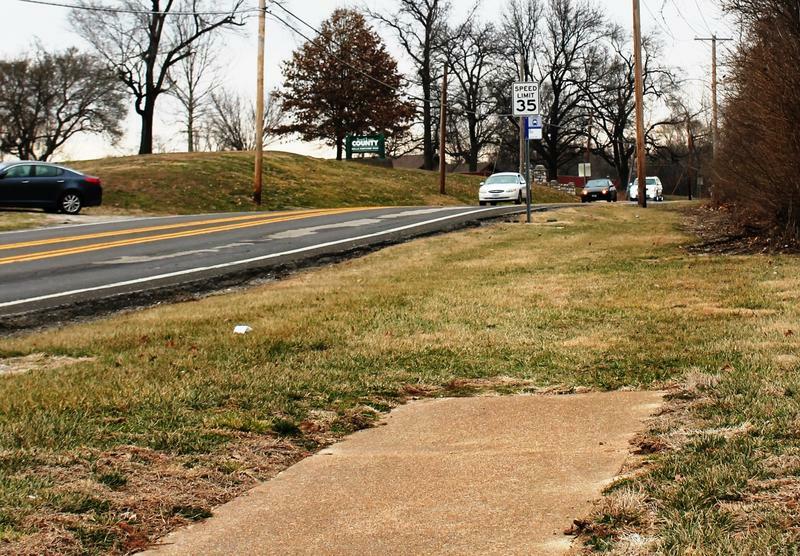 The difficulty in traveling even short distances without a car prompted Constantine to ask our Curious Louis project why sidewalks are often so few and far between in St. Louis County.